One of my dreams was to see New York during Christmas – walk down 5th Avenue, be awed by the stores’ decorations – probably influenced by way too many Hollywood films. Nonetheless Bruno and I headed to Manhattan for the last few days of 2014, ready to see what this was all about and planning on ringing the new year’s bell in city. We did not have any snow but we did have the full NYC Christmas feel! We spent most our time in Manhattan and managed to see all the top sights and attractions, and some more. We did not visit any museums as we preferred to take on the streets, buildings and outdoor features the city has to offer. On our first day, “fresh” from our red-eye from San Francisco, we walked through our local neighborhoods: Lower East Side, West Village, and Washington Square, as well as Greenwich Village. This was a great way to discover the residential areas of Manhattan, streets filled with restaurants and coffee shops, and away from the touristy icons of the Empire State Building and Times Square. Several of my colleagues from the East Coast mentioned we should visit the Highline, so we made sure to head that way. I had never heard of it but we were glad for their advice – the Highline is a new elevated garden built over the old railroad, wandering through the Meatpacking district and providing interesting and unusual views of the area. Make sure to check it out, definitely worth the visit. And that’s only one of the many unusual places in New York any visitor should check out! Heading to Lower Manhattan in quite a cold weather, we strolled Wall Street, walked through Trinity Church, and paid our respect at the 9/11 Memorial Museum and the twin pools. The area around Wall Street is filled with history, going back to mid-1600s with the naming of the area by the Dutch as “de Wall Straat”, possibly marking the side of the New Amsterdam settlement. 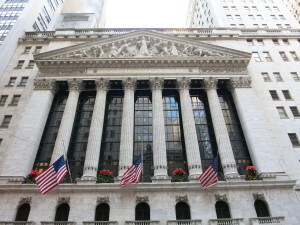 Later around 1711, Wall Street was made the first official slave market by the New York City Common Council for the sale of slaves, mostly Africans and American Indians. 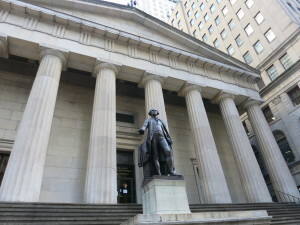 Several historic events linked to the birth of the new United States of America took place in Wall Street, from the inauguration of the United States’ first president, with George Washington standing by the nearby Federal Hall on an early April 1789 and taking the first oath of office of the history of the new country, to the passing of the Bill or Right. At the time our of visit, I was in the process of getting my US Citizenship, and it was moving to be standing where my soon-to-be-new-country became one. I felt I was standing there with the crowd, cheering George Washington as well on that historic day. 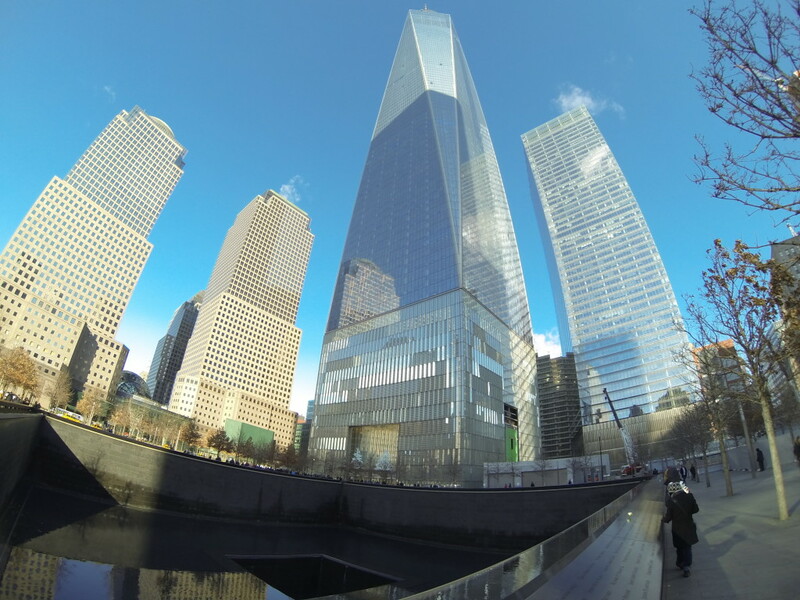 Another sober part of New York City is to be remembered at the 9/11 Memorial Museum & Twin Pools. A moving testament to the horror of that September morning, the mood while walking around the pools is definitely subdued and emotional. Sitting where the Twin Towers stood, the pools are surrounded by bronze panels carved with the names of the victims of the attacks. Birthdays of the victims are commemorated with white roses adorning the side of their names. We spent long moments of reflecting around the pools and the Memorial, hoping such tragedy never to repeat. It was time to head to the ferry to Liberty Island, making our way through Battery Par – we waited a while before boarding, a representation of popular the Statue of Liberty is! We had skip the line tickets, which helped us avoid the queue to buy the tickets, but we still had to wait to go through airport-style security – it is recommended to avoid big backpacks or luggage for faster process. It was a beautiful bay to take the ferry to see Lady Liberty, as she stood tall and proud, awaiting the adoration of the roughly four millions visitors that come to pay her a visit each year. We could not stop taking pictures, wanting to capture the moment by all count. The audio set provided by the National Park is a great way to independently discover the island, mixing structural facts, historical events and little-known details of the Statue’s amazing story. Designed by Frederic Auguste Bartholdi and built by famous Gustave Eiffel, the Statue of Liberty was a gift from my fellow citizens of France as a symbol of freedom and democracy, dedicated on October 28, 1886. It took us several hours to walk through the park, getting up the Pedestal and enjoying views of the original Torch. Thanks to the clear day, we also had fantastic views of New York skyline. Though we had not been able to secure tickets to the Crown, visiting the Statue of Liberty is a must-see. Just make sure to set enough time to do so, it’s worth it. With this popularity in mind, tickets are sold very quickly, especially the Crown tickets which are sold out months in advance. The tickets also include access to Ellis Island and its Immigration Museum. One of the largest urban parks in the United States, Central Park is indeed central to New York life, the opportunity to feel lost in the woods while surrounded by over 1.5 Mio. inhabitants. The scene of so many movies, I was expecting to see crews for movie studios at every corner as we strolled through the park. A Law and Order fan, the TV series music was playing in my mind, picturing the opening scenes under one bridge or one tunnel. The surprisingly nice crisp weather of this past December allowed us to have a very pleasant walk, taking in the winter scenery and watching street performances along the way. From joggers, bikers, family playing with kids, Central Park is both a place to relax or get energized – vital to New Yorkers and visitors alike. Rockefeller Center needs no introduction, but to my surprise, this is more than one building, actually 19 buildings! The creation of the Rockefeller family around 1930, spanning between Fifth and Sixth Avenues and declared a National Historic Monument in 1987. Beside fancy shopping and TV shows, Rockefeller Center is also the home of Manhattan’s most popular ice rink during winter. Tickets and skate rental are available for purchase, though there might be some long queue. Thanks to reserved access to the VIP Igloo, we did not have to wait, got our skates on our feet in no time. With the entrance during on the rink, we were gliding right away, skating like we were pro (or trying to be!). The VIP Igloo was an amazing treat, allowing us to take breaks, enjoying hot chocolate and cappuccino, watching other fellow skaters enjoying their time on the rink. After two hours of pure white Christmas fun, we made our way to the Top of the Rock, our first stop of the day to one of the tallest building in New York. 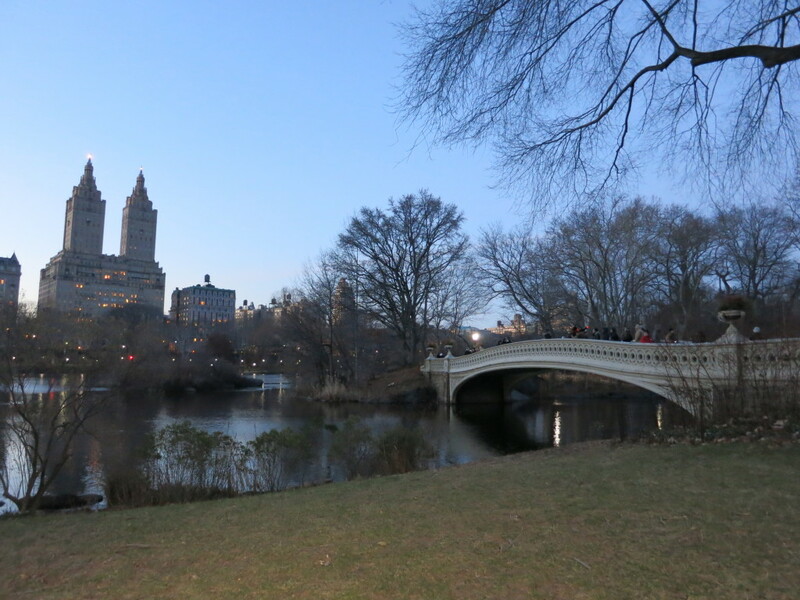 From there, we had fantastic views of Central Park, Manhattan, and the overall New York skyline. We headed to Brooklyn Bridge on our last day, quite overcast and colder than the others. We bundled up quite well and starting walking across the famous bridge. While we were on our way, it started to snow, making our wish for a white Christmas a reality! These were just a few flakes and did not last long but it was pretty nice to see. Arriving in NYC’s second-biggest borough, we checked around some Brooklyn’s DUMBO restaurants and boutiques, stopping for a warm hot chocolate along the way, a welcome break to warm us and keeping us dry from the now pouring rain. We decided to take the subway to Coney Island where we were welcomed by even more rain. This put a bit of a damper to our visit and cut short our time there. But it was enough for us to see why this is a popular location in the summer, with an amusement park, seaside resort, and a famous boardwalk. Though the attractions were closed for the season, the whole area still had a festive spirit! 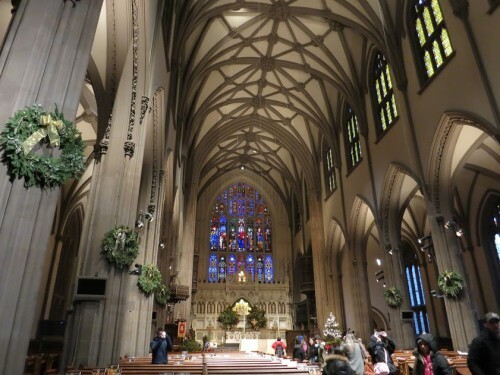 Winter, and especially the holiday season, is an amazing time to visit New York City. 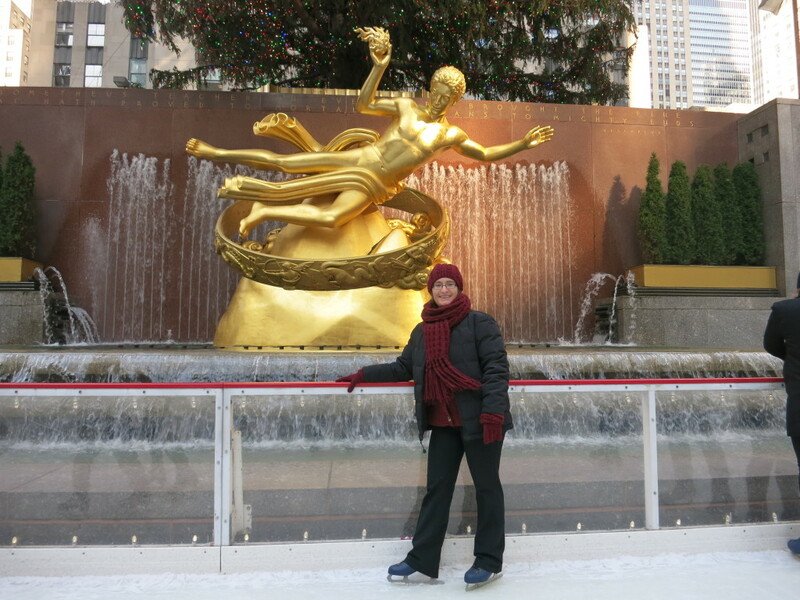 We loved our time during the festivities and would love to return to enjoy NYC again. Looking for more cities in the winter? Check Quebec City in winter for fun across the border.